Follow The 'SBR on Twitter! Less than two months after Canadians went to the polls to hand Prime Minister Stephen Harper's Conservative Party a second consecutive minority government, the country is in the grip of its worst political crisis in 13 years -- one that could see the Harper government fall as early as January to a coalition of opposition parties without the voters' blessing . Harper's government, which won re-election in October but failed to win a majority in Parliament, could have fallen in a no-confidence vote that was scheduled for Monday. But Governor-General Michaelle Jean, Queen Elizabeth II's representative as head of state, exercised a rarely-used authority and suspended Parliament until January 26, when the 2009-10 federal budget is scheduled to be unveiled. Jean had the option of either suspending Parliament, dismissing Harper outright and calling another election or allowing the opposition's no-confidence motion to be voted on and then ask opposition leader Stephane Dion to form a government in a rare coalition between the three opposition parties not seen in Ottawa since World War I. The embattled prime minister delivered a rare televised address to the nation Wednesday night from his Parliament Hill office in Ottawa, in which he criticized the two opposition parties -- the Liberals and the New Democrats, backed by the pro-independence Bloc Quebecois -- for attempting to "thwart the will of the Canadian people" and form a coalition government just seven weeks after the October 14 general election. The proposed coalition of the Liberals and the more left-leaning NDP "cannot help Canada," Harper said in his address, in which he made a direct appeal to Canadians to pressure the opposition to allow the Conservatives to stay in power, arguing that the opposition has no "democratic right" to form a government so soon after the election. It is the worst political crisis to grip America's northern neighbor since the 1995 Quebec independence referendum that almost tore the country apart. Never before has a Canadian government faced ouster so soon after the ruling party won re-election. The opposition's planned no-confidence vote in Parliament on Monday ironically would have fallen on the same day that Quebecers go to the polls in a hotly-contested early general election in the French-speaking province, where the minority Liberal Party government of Premier Jean Charest is also fighting to stay in power against the opposition conservative Parti Action Democratique and the more militantly pro-independence Parti Quebecois. It is not unusual in parliamentary democracies elsewhere for the party that wins the greatest number of seats in a general election to fail to win an absolute majority in parliament and must form a coalition with other parties in order to govern. But Canada has not experienced a coalition government at the federal level since World War I and at the provincial level since the early 1950s in British Columbia. Canadians had grown accustomed to elections in which if the largest party fails to win a majority, it forms a minority government and then must compromise with opposition parties to pass legislation. Historically, minority governments in Canada last an average of 18 months, although Harper's Conservatives, which ousted the Liberals in 2006, survived for 21 months before calling an early election for October 14 in the hopes of winning a parliamentary majority. But those hopes were wiped out by the economic meltdown that rocked the world in September, resulting in yet another minority Conservative government, albeit with a slightly larger plurality. The Conservatives currently hold 143 seats in the 308-seat House of Commons, 12 seats shy of the 155 needed for a majority. The opposition Liberals hold 77 seats, the Bloc 49 and the NDP 37, for a combined total of 163. "At a time of global economic instability, Canada's government must stand unequivocally for keeping the country together. At a time like this, a coalition with the separatists cannot help Canada," he said, referring to the Bloc Quebecois. "The opposition does not have the democratic right to impose a coalition with the separatists they promised voters would never happen," Harper continued, accusing the opposition of attempting to "impose" the coalition on Canadians "without your consent." "This is no time for backroom deals with the separatists; it is the time for Canada's government to focus on the economy," he said, calling the parliamentary crisis a "a pivotal moment in our history." With his government's back against the wall, Harper repeated his vow to use "every legal means" to block the coalition "to protect Canada." 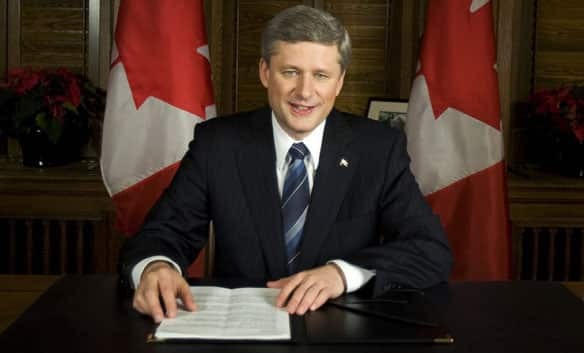 Harper also made a play for time, saying that the fiscal 2009-10 federal budget scheduled to be unveiled on January 27 will "contain additional measures to boost Canada's economy, while making sure we avoid a long-term structural deficit in Canada's finances." The crisis was triggered by what the opposition parties say is the Harper government's lack of action in response to the worsening effects of the global economic crisis on the Canadian economy. When their call for an economic stimulus package was ignored by the Conservatives, opposition leaders decided to forge an unprecedented coalition to oust the Harper government and form one of their own, with Dion as interim prime minister. Dion resigned as Liberal leader following his party's loss in the October election, but would serve as prime minister in a Liberal-NDP coalition government until a new Liberal leader is chosen at a party convention in May. In a taped rebuttal broadcast shortly after Harper's address, Dion defended the notion of a proposed coalition government "as normal and current practice in many parts of the world." Moreover, the Conservatives — largely based on their reaction to Canada's financial crunch — have lost the confidence of the majority of members of the House of Commons and thus, "have lost the right to govern," Dion said. Dion said he sent a letter to the governor-general on Wednesday, urging her to reject any attempt by Harper to suspend Parliament. "If Mr. Harper wants to suspend Parliament, he must first face the vote of confidence," Dion said. "In our Canada, the government is accountable for its decisions and actions in Parliament — your Parliament," he told Canadians. NDP Leader Jack Layton said Canada is at "a crossroads in our collective history" where there is a coalition government waiting in the wings to take over from the sitting Conservative government, which he maintains has done little to help ordinary Canadians during these tough economic times. "An economic storm unlike anything seen in a generation is upon us and Canada must have a strong and effective government that holds the confidence of Parliament. Tonight, we do not," Layton said. "A new kind of government, with a new kind of politics, is ready to serve, one that will put the economy and working families first." For his part, Bloc Quebecois leader Gilles Duceppe is not backing down from his decision to support the proposed coalition government -- which is having some impact on the campaign for Monday's provincial election in Quebec. "I ask Mr. Harper to let the House of Commons vote, that we are finished with his government," Duceppe said according to an advance copy of his speech delivered in response to the prime minister's address. "We can work to fight with all our strength the economic crisis that faces us." Pauline Marois, leader of the Bloc's more hard-line pro-independence provincial cousin, the Parti Quebecois, is putting pressure on Premier Charest to take a side in the power struggle unfolding in Ottawa. Marois accused Charest, leader of the Quebec Liberal Party, of letting the province down by refusing to take an official position on the ongoing federal parliamentary crisis. Marois also demanded Charest speak up about the advantage she said the Bloc secured for Quebec by supporting the Liberal-NDP coalition -- a highly unusual move, given the decades-long rivalry between the Bloc and the federal Liberals. Charest said he won't get involved in the power struggle between the Conservatives and opposition parties because neutrality is the best path to lead Quebec. Jean, whose post as governor-general representing the queen is largely ceremonial, nonetheless possesses extraordinary powers she has the authority to exercise in times of extreme crisis. The unprecedented nature of the political crisis gripping Ottawa made it apparent to the governor-general that she had to step in. "Today's decision will give us an opportunity - I'm talking about all the parties - to focus on the economy and work together," the prime minister said outside the front door of Rideau Hall, the governor-general's official residence. The decision also sets the stage for a fierce partisan battle for public support between Harper's Tories and a proposed opposition-party coalition over the coming weeks, during which Jean could, if necessary, intervene again by dismissing the government altogether and calling a new election. No Canadian governor-general has ever actually dismissed a sitting prime minister. Indeed, throughout the worldwide Commonwealth of former British colonies that still recognize the British monarch as head of state, only once has a governor-general done so. In 1975, Australia's governor-general, Sir John Kerr, ousted Prime Minister Gough Whitlam's government amid a constitutional power struggle between Australia's upper and lower houses of Parliament, which were controlled by different parties. Australia amended its constitution three years later to cut out any involvement of its governor-general in government. In 1999, a referendum on declaring Australia a republic with a ceremonial president as head of state failed. Although the opposition Liberals hold a substantial majority in Canada's unelected upper chamber, the Senate, no such power struggle between the Senate and the Commons is expected, nor is Jean likely to dismiss Harper, although circumstances might force her to intervene in other ways. The Haitian-born Jean, Canada's 27th governor-general, is the first person of African descent to hold the post. Ironically, Jean moved to Canada with her family as a little girl to flee the political violence that ripped apart her native country during the last days of the Duvalier dictatorship. The power struggle -- unprecedented in a country with an international reputation for its politics being dull almost to the point of putting people to sleep -- has galvanized Canadians in a lively mixture of confusion, disbelief, anger and delight. A random sampling of comments posted to the Web site of the Canadian Broadcasting Corporation since news of the coalition emerged less than a week ago suggests Canadians are roiled as never before. Many people writing to the CBC expressed anger over what they feel is an attempt to nullify the results of October's election, with many openly accusing the opposition parties of attempting the equivalent of a coup d'etat. "Our country supposedly is a democracy, but the opposition is talking like any other country that just overthrows the government because of disagreements," one poster wrote. "Honestly, are we the same as other countries that act against what the people want?" "Why should we even bother to vote if it no longer matters what the outcome? What a waste of the $30 million we spent on the recent election!" wrote another. Others are going further than simply calling the opposition parties' moves undemocratic. The attempt to defeat the government and form a coalition is "nothing more than a bloodless coup that does not in any way take into account the will or decisions made by the people in Canada," wrote a Toronto man. "Why have an election? Why make light of Iran and other countries' abuse of power?"